Body language in an interview – what does it say about You? Scientists point out that the words we say count only for 15% of the message we send over. The rest–whooping 85% of the message, consists in our body language, our, if you want, in our nonverbal communication. Can you benefit from this in a job interview? And can we control our body language? How to send the right signals to the interviewers and hiring managers? And, do the HR professionals pay attention to the body language of the job candidates? We will try to answer the questions in this article. Can we control our body language? Do interviewers observe your body language? In the true sense of the word, we can not control our body language. Neither can we do it in a date, nor in the meeting with the recruiting managers. Our body reflects the state of our mind. If we do not feel good in the room, if we do not like the person we talk to, if we do not believe in our chances to succeed--it will all reflect in the way we look, gesticulate, and talk. This observation leads to an interesting conclusion: While we cannot control our body language, we can (at least to certain extend) control the things that determine our body language. That means: our emotions, our feelings, our mindset in the interview. To improve your body language, you should focus on improving your mindset, and also your physical well-being on a big day. Believe into your chances, have confidence and think that you can (or even will) succeed in an interview, and get a job you want to have. This is your day. Be ready to succeed! Have a good sleep before the interview, rest well, and grab a cup of green tee, or coffee, before meeting the employer–especially when you feel tired or sleepy. You can also devote yourself to a short mediation or to other mind-relaxing practices. Think about the interviewers in good means–try to consider them your allies, people who want to hire you for the job (most people consider their interviewers their enemies, which is a huge mistake and reflects strongly in their body language). Try to take it easy–if life’s not at stake, nothing is. Stressing out won’t help your chances. It won’t help anyone, so try to stay calm. Companies hire positive people. Once I heard that smile is like a flu. Once you smile on someone, they will smile back :). In most cases it will work this way. Try to be positive about your chances, about your future, the company, the future of the world (though at least the last one is a difficult task indeed). Positive mindset will reflect in your body language, and your chances to get hired will improve immediately. People recruit friends, and honest people. Eye contact can do a lot for you in an interview. Looking into the eyes reflects honesty, and friendship. Try to be honest, try to speak as if you had nothing to hide. It depends on the person who leads the interview with you. The top-notch interviewers and recruiting consultants possess high emotional intelligence. They observe your non-verbal communication without even thinking about it. Not all recruiters and interviewers have the skills, however. Some people will notice the very basic things only, and for them your interview answers matter the most. And some people may be so absorbed in their duties and problems (personal or professional, doesn’t matter) that they won’t pay attention to your non-verbal communication at all. Nevertheless, you never know who you will talk to in your interview. Improving your mindset, which subsequently leads to an appropriate body language, can only help you to get a job. At the end of the day, interviewers are only men, and women. If you are attractive, you can try to benefit from your beauty in an interview. While it is highly unethical to propose a date, or anything of that kind (doing that will more often than not result in a rejection of your application, at least in a serious company), you can still tell the interviewers that you like them, that they are attractive–you can tell it with your eyes. Eyes are brave, mouth shy. This is how it works many times, even in relationships outside of the workplace. And once again, it is a question of your thoughts. If you like the interviewer (as a man or a woman), you do not necessarily need to fight with this thought, and try to get rid of it. We all like when other people consider us attractive, especially when we speak about a mutual attraction… Use this for your benefit in a job interview. Interview success package – Multiple brilliant answers to thirty most common job interview questions (including the very difficult behavioral questions), and a guide on how to win your interviewers over. In three hours from now, you can learn everything you need to know to succeed in your job interview. Will you make the right decision? Interview attire special tips – Some interview attire tips for the brave, and for people who like to experiment with their clothes in an interview. How to answer interview questions – It is not only about what you say, but also how you say it in an interview. 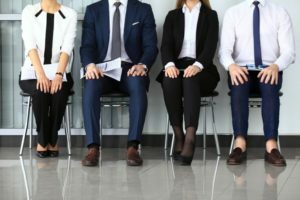 Another article that talks about non-verbal communication in a job interview.